This Sunday (December 18), Golden State Auction will be offering some truly extraordinary Chinese and Asian antiques in their 350 lot inaugural auction. They've certainly aimed to start with a bang. The San Francisco auction house will be offering breathtaking pieces including a gilt and lacquered bronze figure of Dipamkara. He is shown seated in dhyanasana dress with long flowing robes left open at the chest. The serene face with one eye open wider expression beneath a large protruding urna set amidst the whorls of hair, and seated on a lotus base. 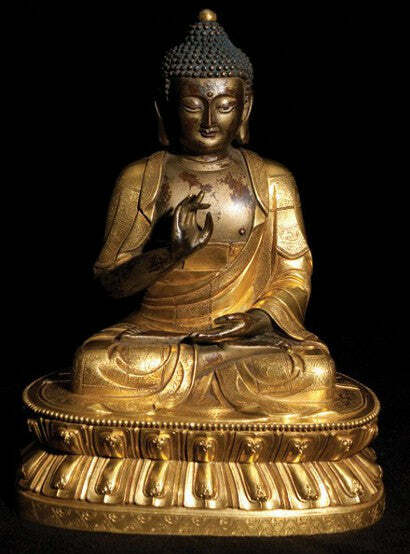 The Dipamkara Buddha is expected to sell for $200,000-$300,000. Apart from this figure, the biggest hitters in the auction are almost certain to be antique rhinoceros horn cups. Of course the creation of such cups now would be illegal, but it does happen, so bidders should always be careful to be certain of such an item's authenticity. In fact, there are two key lots for those interested in these antiques: lot 33 is a 17th Century horn cup oval contour with a key-fret band incised around its spreading rim. The reticulated front legs and head of a chilong dragon climb up its exterior against a carefully worked band of flower-heads. This is expected to sell for $30,000-50,000. 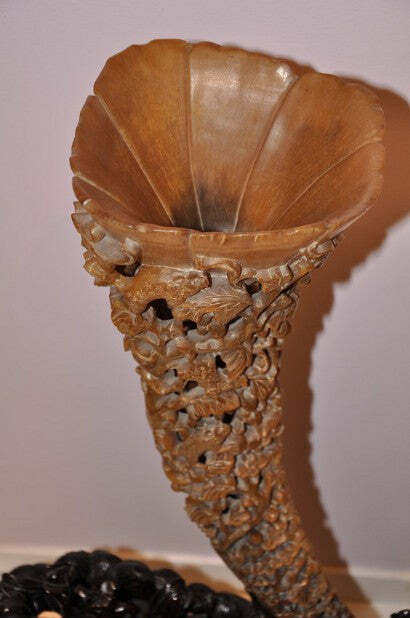 The top lot, however, is likely to be 34: a 19th Century pair of large reticulated rhinoceros horn cups. Of oval-sectioned baluster form, these have been meticulously carved to show beauties strolling through grapevines. They are expected to achieve $300,000-$500,000, and such items have often charged past expectations in recent times.